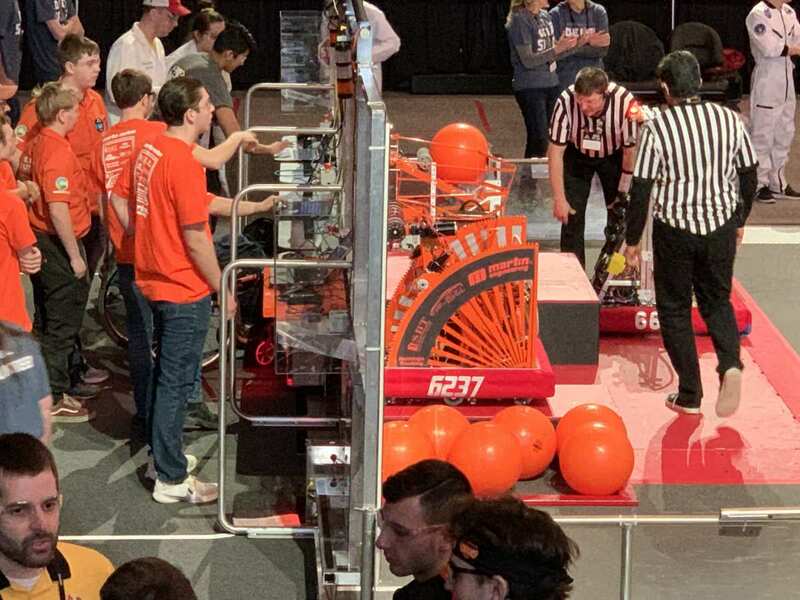 40 teams, some from as far as Canada and Turkey, competed at the Central Illinois Regional and Martin Motion finished with a rank of 11 and a record of 6-7-0 and served as captain of Alliance # 8. Being eliminated from the playoffs in the quarterfinals round, Martin Motion (Team # 6237) cheered on fellow robotics teams and was excited to win the Imagery Award in honor of Jack Kamen. This award celebrates attractiveness in engineering and outstanding visual aesthetic integration of machine and team appearance. In Idaho, 27 teams attended, including a team from Mexico. Finishing with a ranking of 9 and a record of 7-5-0 and serving as captain of Alliance # 6, Martin Motion’s robot suffered a competition-ending electrical failure just minutes prior to the start of their playoff match which caused the team to withdraw from the competition and select a substitute to compete in its place. 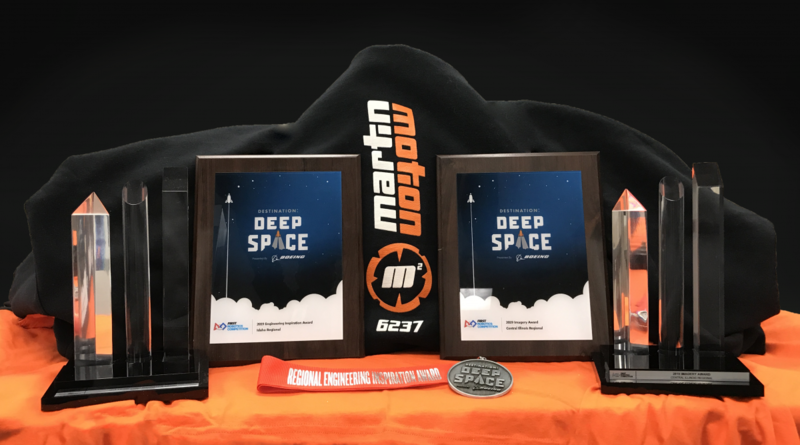 Team # 6237 ended up being eliminated from the playoffs but due to winning such a prestigious award, the Engineering Inspiration Award, Martin Motion advanced to the World Championship which will take place April 24-27. The Engineering Inspiration award recognizes outstanding success in advancing respect and appreciation for engineering within a team’s school or organization and community. Adding to the excitement of the impending World Championship, Martin Motion’s trip will be sponsored by NASA who will pay for the team’s registration fee! This will be Martin Motion’s second consecutive trip to the FIRST Championship event in its four years of existence. Students from Alwood, Annawan, Bureau Valley, Cambridge, Galva, Geneseo, Kewanee, Stark County, and Wethersfield make up Martin Motion – Team # 6237. Martin Engineering is a proud sponsor of Martin Motion and enjoys providing opportunities for students to learn more about STEM (Science, Technology, Engineering, and Mathematics). Martin Engineering, founded in 1944, is a family-owned business located in Neponset, Illinois that has patented hundreds of products to make the handling of bulk materials cleaner, safer, and more productive. By helping to inspire students and ignite these academic principles, Martin hopes to see an increase in youth pursuing careers in STEM-related fields. With the help of Silver and Bronze sponsors (Nanninga Trucking, State Bank of Toulon, Nelson Auto Sales, Aluminum Castings Company, Strategic Retirement Partners, Alfa Plastics, Martin & Sullivan Inc., Rumbold & Kuhn Inc., Margaret Devenney, Chicago Tube & Iron, Boss Holdings Inc., and Quality Cable & Components Inc.,) and other local businesses and supporters, Martin Motion is able to operate as a cost-free program to all students, allowing for students to have the same level of opportunity and engagement no matter what their financial situation is. Kewanee Physical Therapy & Rehab and Kewanee Flemish American Club sponsored and donated to the trivia night fundraiser, LaGondola Spaghetti House generously hosted a spaghetti supper fundraiser, and Club Colors donated the team attire. In addition to focusing on STEM, the robotics program encourages socialization among students from several area schools as well as robotics teams all across the world. FIRST Robotics provides an outlet and opportunities to socialize with people with similar interests that they wouldn’t normally cross paths with. If interested in learning more about or supporting this worthwhile cause, please email: sethm@martin-eng.com.